Party at St James Church marking Windrush. 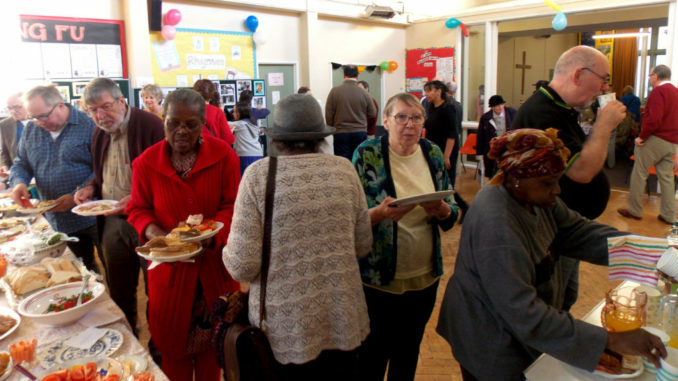 On 29th September 2018, St James Church on Scott Road held a party, marking Windrush. The Empire Windrush was a ship that transported Caribbeans to the UK during a labour shortage. The term ‘Windrush’ covers those who came from the West Indies and beyond in the fifties and sixties. On arrival in the UK, many faced low wages and appalling abuse. Even today, these same people and their descendants still face discrimination. Many people attended the party. There were lovely old photos, detailed presentations and food provided by the congregation. Some people there told me how when they first came to Sheffield, they visited different churches but felt uncomfortable at them. However, they said the congregation at St James had wholeheartedly welcomed them. Some 330 children of Jamaican parents were baptised here between 1956 and 1968 and 175 weddings took place. Zadie Orr, who came from Jamaica as a child, led the prayers. I chatted with people who remembered the ‘strong’ Marjorie Saunders, a deacon at the church from 1966-1976. Marjorie was the only Burngreave resident to be nominated for a Nobel Peace Prize. I saw ‘Longing to Belong’, a film about racism endured by the Windrush generation, and a powerful film focussing on the injustice served upon them. I had a sensational time and didn’t want the day to end.